“The Zincite in this mandala seems to float above its white and silver background. 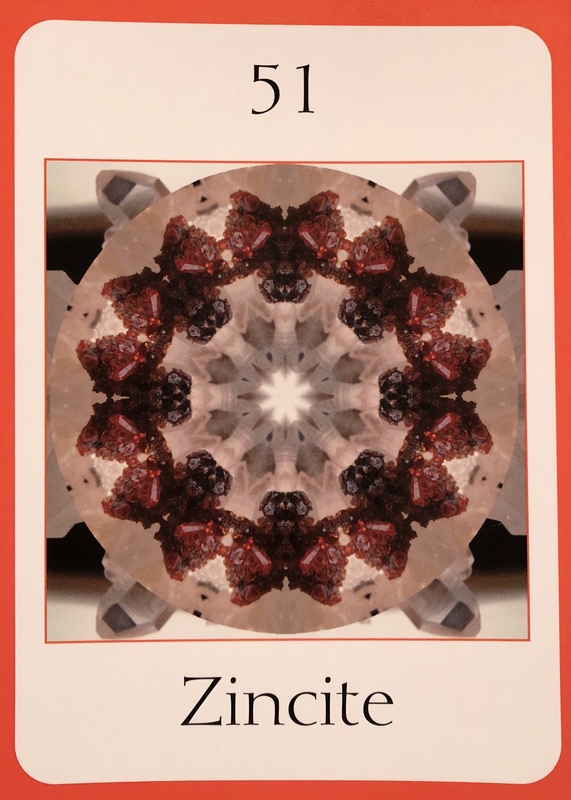 If we examine the mandala more fully we see that the Zincite functions as a ring, protecting the inner core which has taken on the shape of a white eight-sided star. This star is guarded by eight star birds. There are sixteen beings that are the manifestation of the Zincite Oversoul. They wear long precious silken robes in shades of orange and red with hints of dark brown. The beings have a quality to them that we have not encountered with any of the Oversouls before. They greet us with an intensity to their gaze which is unsettling and comforting in the same moment. The beings guide us towards the temple by taking us into their light-bodies. We close our eyes, relax and surrender to their guidance. When we reach our destination we open our eyes and absorb a vision of incredible splendour. Straight ahead we find an enormous pulsating mandala of intricate beauty. To us is looks like a giant stained glass window made up of orange and red glass segments. The air, pungent with the heady scent of sandalwood, adds to our sense of drama. As we do, we begin to feel a powerful connection to the star. Something in us seems to be dialoguing with the eight-sided star behind us. We feel as though the star knows we are here, it is talking to a deeper part of us. We close our eyes slipping into a blissful sense as if we merge with all that is. The deep scent of sandalwood catches our attention and we become aware of its rich smoke wafting around us. We slip into a deeper level of consciousness and pass, with our inner eye, along the planets of our solar system. Our awareness is so vast that we experience the planets inside our own body. We feel the planets move in their orbits. We hear them turning, acutely aware of the sounds each planet generates. We are as vast as the cosmos, holding all in our being. We are deep space and our breathing remains calm as we absorb our experience. It is then that we hear the voice of the Zincite Oversoul speaking directly to us: “Beloved one. The time is here to awaken from the dream – while being as open and vast as the cosmos. The planets in your universe have also been going through a series of initiations. As the Earth has been raised in vibration so too has your solar system. So many distractions, so much fear and manipulation. So many things to keep us too busy. Hardly any time to think, to connect, to just Be. We are being pulled in so many different directions at once… it is exhausting on every level, physically, mentally, spiritually. We are not encouraged to take time for ourselves, that is considered a luxury, selfish. How often do we feel as if we are on the hamster wheel, running and running and running and not really getting anywhere? And with the holiday season on the horizon, it’s about to get ramped up even more as the year finishes off on a high note as per usual. Yet we all know deep down that the true mystery of life lies in the most simple experiences. Being outside in nature. Silent contemplation. Beautiful music. The simple, tactile things in life that stimulate our senses in a natural way… no the overstimulation of the technological or material worlds. It is up to us to change how things in our lives feel to us. If something isn’t working and yet we just keep doing it out of habit, then it is our own fault for not changing it. We are the only ones to blame for getting caught up year after year in the insanity. What can you do today to give yourself some space? A little reprieve, some room to breathe. Release something that is a habit, a time waster or something that makes you feel resentful, unappreciated or overwhelmed. And fill that spot with something quiet. Something balancing, peaceful and centering. Something that brings you back down to Earth, connected, mindful, calm. Take a walk outside. Listen to Solfeggio music. Practice yoga or deep breathing. Meditate. Contemplate. Just Be. Because life is flying by at turbo speed. And this is one of the only ways we can slow it down a little. Stop feeling like we are sleepwalking and awaken to the magic that is Now.